Crom commands that you play these three Conan-themed titles! Conan made his way back to consoles and PC earlier this year with Conan: Exiles, Funcom’s addition to the burgeoning survival game genre. The game itself centers around an exile who is freed by Conan to go and… well, I’m not really sure. Survive? Craft items? The best way to describe it is Minecraft with a dash of Skyrim-lite fighting. I’m almost a level 20 character and there doesn’t seem like there’s much plot or story. Thus far I have bravely chopped down trees, fearlessly killed some weak turtle creatures, and boldy built simple rock structures. I’m living the Conan dream! While I am still trying to make up my mind on Conan: Exiles, it’s not like I am without options for living out my Hyborian Age fantasies. Tabletop gaming provides a few options for gamers to scour ancient ruins, confront evil wizardry, and bed tavern wenches at their leisure. Crom, cold and uncaring on his lonely great mountain may not care if you play these games, but I think you should give them a shot. RPG fans can bring barbarism to their game table by checking out Modiphius’s excellent Conan: Adventures in an Age Undreamed Of. 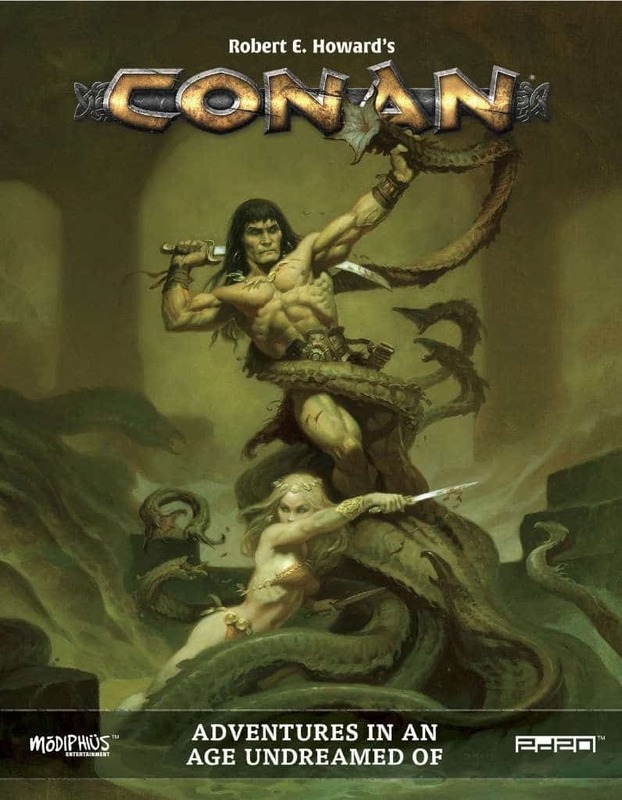 The design team at Modiphius are true Conan purists, taking great pains to follow the true heart of the Robert E. Howard character, closely aligning their game world to the original pulp hero’s roots. Modiphius hired Robert E. Howard scholars and Conan fans to make sure their design was authentic to the original vision of Conan instead of focusing on the muscled tough guy pastiched by later writers. What comes out of this game is a thrilling and deadly take on Howard’s Hyborian Age. The core rule book is expansive, clocking in at 356 pages, covering everything a player or GM needs to start adventuring in the age before history. The core rulebook is beautiful, not just for its dedication to the source material, but it’s excellent artwork and layout are impressive. The design of this book is amazing! It is one of the most gorgeous designs I have seen in quite some time. Gameplay in Adventures in an Age Undreamed is unique. The game uses Modiphius’s 2d20 system, but players will also need d6s as well (and probably a handful more d20s… you can end up rolling a lot of d20s at once). Players only need the core rulebook to play, but they have plans for a proverbial treasure horde of books. Fans can also click here for more information on the massive amount of books that are anticipated in this product line. The amount of content rivals Conan’s bulky arm muscles, but just barely. 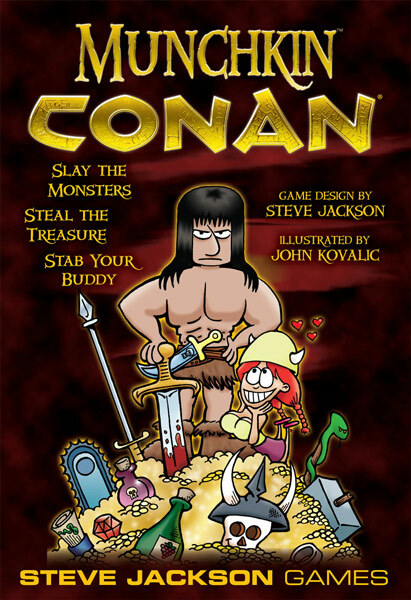 If backstabbing and looting is your thing, the folks over at Steve Jackson Games have always been there for the devotees of chaos and mayhem with their humorous Munchkin line of games. For the uninitiated, the premise of the Munchkin games is deceptively simple: players kick down the door, fight monsters, and then clammer for the loot. The catch is that players often need help in defeating the monsters, which means they must get help from other players, who are also trying to backstab their way to level 10. Munchkin has created and killed many friendships. It’s a fun trip down chaos lane. Known for their various licensed versions of Munchkin games, Munchkin Conan the Barbarian joined the line in 2012. Though the game is superficially based off the flunky 2011 Conan the Barbarian reboot, do not let that deter you from trying out this more silly take on the Hyborian Age. Conan doesn’t have to be so painfully serious all of the time! Like any of the Munchkin games, cards in the Conan set can be mixed and matched with any of their other games. There is also a single fifteen card expansion pack to add more savage mirth and mayhem to the game. Monolith’s massive Conan self-titled board game is a thing of beauty. It’s a big, expensive box board game like Gloomhaven. Don’t let the pricetag scare you. It is worth every penny. It comes with over 70 miniatures, four character sheets, cards, multiple maps, and all the rulebooks needed to play. In addition to the main game, Monolith has released several expansions, including different regions and new characters to add to the game. Their website offers more scenarios and downloads to flesh out the game even further. Game play reminds me of the Dungeons & Dragons 4th Edition public play game Lair Assault. 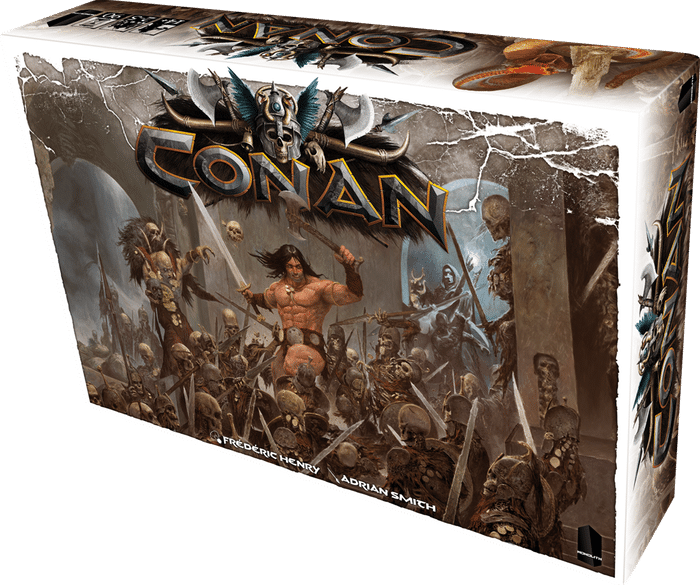 Much like that game, Conan puts players in a difficult scenario and asks that they use tactics, good action economy, and a bit of luck from Crom to successfully complete the scenario objectives. Each scenario provides a round limit in which players must complete their objectives. The game itself is brutal, with all the eldritch horrors, cutthroat pirates, and downtrodden ruffians one would expect from the age of Conan. Game aids and player mats help walk players through the game. Each game takes about 90 minutes, though I have found that set-up and break down can significantly add to that time as well. With a game that has many parts as this one does, it can take considerable prep time. Once gamers are done “surviving” Conan:Exiles, they can actually sink their teeth into any of the above games to get a feel for the world of Conan. I promise players won’t have to chop a single tree down or craft leather clothing once during any of these games. Now get out there and make Crom proud. Or don’t. Afterall, he doesn’t really care. Nerds, realize how good you really are.